With a new colour, slot technology, enhanced grooves and improved alignment, you might think we are talking about the latest fairway wood or wedge, but in fact we are talking about the latest range from Yes!, the Yes! i4 Tech putters. The range features the Callie and Rachel blade models and a mallet design named Stephanie. We decided on Callie and took her out to the putting green and the course. As you will see in the photo above, the most noticeable thing about the new i4 Tech putters is the colour of the new finish. Yes! have added this "Antique PVD" colour to the range to offer a new, unique, eye-catching, rich look. 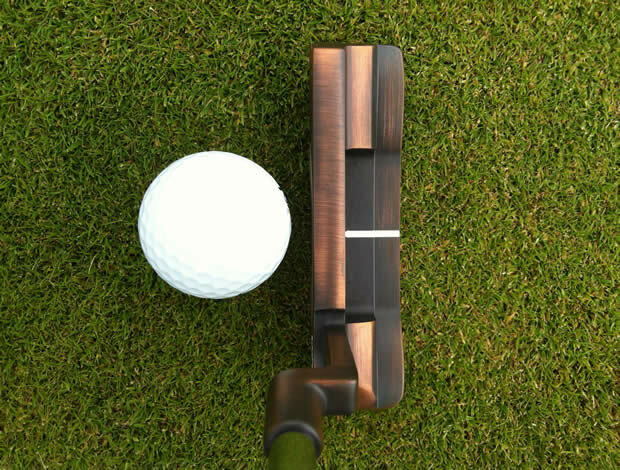 The brushed, copper-like finish is very attractive and will remind you of the original PING Anser designs. It almost looks wooden in person, but did offer a great contrast against the ball, the surrounding grass and particularly the single, white alignment line in the rear of the head. The clubhead is attached to the shaft thanks to this plumber neck hosel that has a full shaft offset, meaning the club face is set back one shaft-width from the bottom of the shaft. 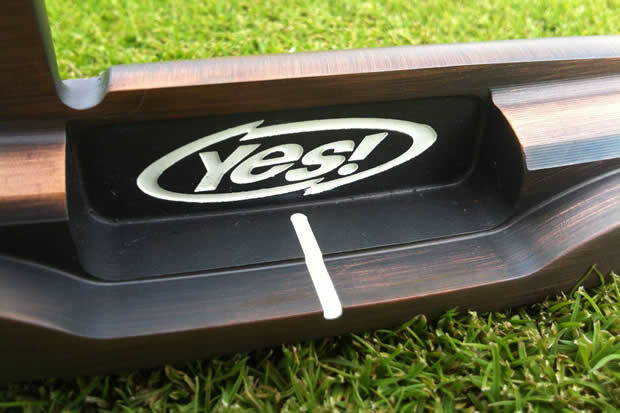 This has been the classic design of many putters in this shape for years with past versions of the Yes! Callie model. The other two models have slightly different hosels and weighting, check out the i4 Tech product page for more details. The Callie model is geared towards the majority of golfers, who have a slight arc in their putting stroke. The weight of the head and the bend and height of the hosel are specifically designed to aid that type of stroke. In fact, each of the three head designs is specifically designed for one of three strokes. If you have a straight stroke, you would be more suited to the mallet shape Stephanie model. Or if you have a stronger arc in your stroke then the thinner Rachel model is designed for you. But enough about the design, how does it perform? 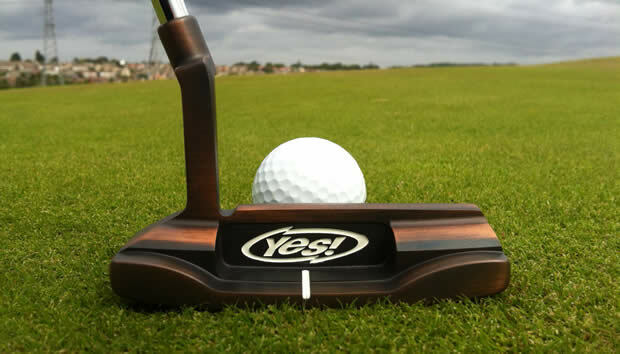 Set the putter behind the ball, and the soft feel of the tacky, three-colour Yes! grip immediately gives you an idea of how this putter is going to feel and perform. The feel is soft thanks, in large part, to several technologies Yes! have added to the i4 Tech range. First and foremost is the C-Grooves that Yes! have built their company on. These are milled into a stainless steel insert that is then added to the face. Yes! take a lot of care in milling these grooves to the highest specifications making sure they are cut into the face at a 20-degree angle. The idea behind the grooves is to lift the ball from where it sits and get it rolling quicker and smoother than a flat faced putter. Essentially the grooves grab onto the dimples of your ball, lift it out of its position and send it on its way to the hole. The grooves certainly do impact the feel of the putter as, with less points of contact with the ball, it feels softer. 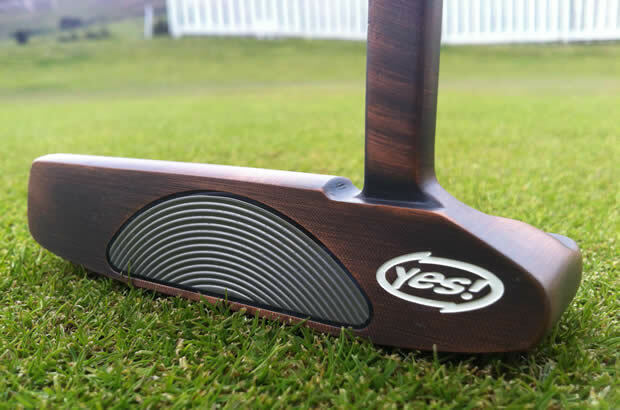 Unlike many modern, high-stability, high MOI putters, the Yes! i4 Tech feels soft. Once you get used to it, you can feel the grooves working, but many will find themselves leaving putts short to begin with. Now, as you may or may not be aware, Yes! is owned by Adams Golf, who themselves are now owned by TaylorMade Golf. Whilst both TaylorMade and Adams have both added slot technology into their drivers, fairway woods and irons. Yes! have now followed suit, adding a "through slot" to the i4 Tech range, which you can see below on either side of the "i4-Tech" writing. But why does a putter need slots? The idea is to dampen vibrations that occur when you strike a putt. These slots are milled behind the face and hold a thermoplastic polyurethane insert (TPU) 65D insert. The TPU material is softer than the steel putter and captures unwanted vibrations from the clubhead, said to improve the feel and responsiveness. To be honest, the feel felt much like most blade-styled putters and whilst the slot technology is a great concept, it is hard to fully appreciate when you are using the putters. One drawback of the Yes! putter is forgiveness. The blade designs are traditional, compact and suited to better players. Whilst the C-Grooves do grip the ball, they themselves are fairly small in the face. Strike a putt off-centre or slightly thin and you will know it. It is perhaps not surprising that whilst you see several Yes! putters on TV in the bags of several top Tour players (Caroline Hedwall holed the clinching putt of the 2013 Solheim Cup with this exact model), you tend to see less in the lockers of amateurs. The Tungsten weights on the heel and toe add some stability to the perimeter of the clubhead, but won't aid on the feel of those mis-hits. Yes! claim that the MOI (Moment Of Interia) of the i4 Tech putters has been increased by up to 40% thanks to the new weights. This may be true, but the feel on off-centre hits hasn't improved. On the plus side the tungsten weights meant the head didn't sway as much on longer strokes as we expected with a blade putter, but we still found a little difference on the strike of longer putts over 20ft. It seemed the harder you struck a putt, the more the feel changed, from soft and responsive to hard and dull. The end-result of the putts was not impacted much by off centre strikes, but the variance in feel and strike was inconsistent. The i4 Tech range range features a new three-colour grip and headcover and the putters themselves can be bought in lengths ranging from 30 to 36 inches, or even longer in the Stephanie Belly and Long models. If you are the kind of player that requires or desires custom fitting, Yes! will adjust your i4 Tech putter by +/- 3 degrees of lie angle and/or +/- 2 degrees of loft to better suit your stroke or conditions. In terms of price and value, the i4 Tech putters are right in the middle of the market and probably where they belong. The brand doesn't yet have the mass following of Scotty Cameron or PING, but the technology is advanced and is worth the investment. If you have a solid, repeatable stroke, it is certainly worth experiencing the wonder of C-Grooves. 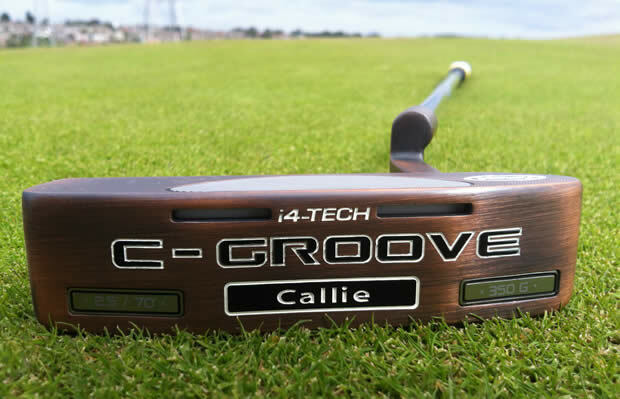 Or perhaps if you have had the same, traditional looking putter in your bag for the last 10-20 years and are looking for something modern, yet traditional in appearance, the i4 Tech is worth your attention. However, if you are looking for a putter to cure your 3-putt woes and essentially do the work for you, this model may not be right for you. The soft feel and performance of the grooves may take some getting used to for a player looking for a quick fix, whilst the limited forgiveness is probably not suited to a high handicapper. If that is you, and you like the Yes! range, perhaps look into the larger, more stable Stephanie model. Phenomenal putter. Extremely accurate, great feel, ball rolls true without bounce. Much prefer this Callie to the Bettinardi and Cameron putters I have been using as it seem to have a much larger sweet spot. I've drained 3 or more 15'-20' putts in the 3 rounds I've used it and I'm not 3-putting. Nice. The new i4 Tech range of Yes! Putters have a new, rich, antique finish. A striking alignment aid and sole balance bar to help you get the perfect setup. Get the Odyssey red-eye for faster route to better putting.